If you love tattoos you know that getting a meaningful tattoo is one of the best feelings ever, especially when someone acknowledges the art. The world we live in today is getting smaller and smaller with fashion trends spreading with great speed. Tattoos have recently garnered great publicity with a lot of celebrities showing off their designs at red carpet events. It is only natural that it has spread like wildfire to the general population. 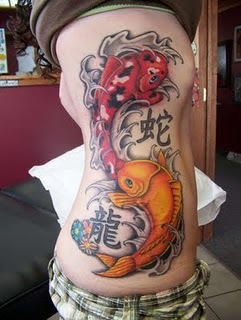 One of the popular designs that has surfaced recently is Japanese koi fish tattoos. Fish in the wild undergo a lot of hardship to reach their destination and this ability has given them a mythical status. They are also found in different colors making it a good choice for a tattoo design. 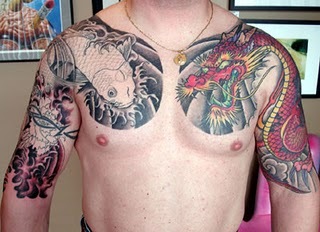 If you planning to get a koi fish tattoo done, just make sure that you do it from a good artist, as the design is intricate. The koi fish resembles perseverance as it swims against the current to reach its final destination. Japanese mythology has a story which states that the koi fish swam up a waterfall and was then turned in to a dragon. It depicts the victory of good against all odds and represents conquering everyday life struggles. 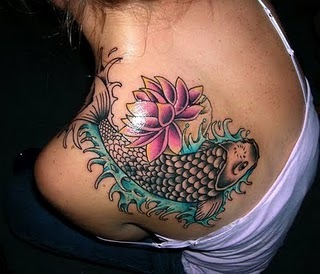 The fish is a symbol of strength and the ability to overcome obstacles in spite of all odds. The Japanese koi fish also represents wisdom and longevity to many and therefore has been adopted by many people across the world irrespective of the cultural background. Some people even get the tattoo as they feel it brings them luck; the koi tattoo meaning is mostly what attracts people to this design. 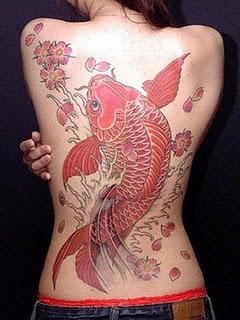 The red koi fish represents love and strength, it is a masculine design and looks great when done on the back or the arm. You can showcase a red koi fish blowing multicolored bubbles to represent the different colors of life. Another way of depicting it is to have it fighting big waves as it journeys through the violent waters. Inking a koi fish gracefully swimming between bright red and yellow color flowers underwater is a very eye catching design that you could get. You can also show a koi fish resting on lotus petals with its tail hanging in the water. If you are imaginative, ink the fish twisting itself around an anchor. Another way to showcase the fish is with a flower in its mouth as if it's offering it to the Gods. Legend has it that the koi fish turned in to a dragon when it completed its journey, so you can show the fish metamorphosing in to a dragon. 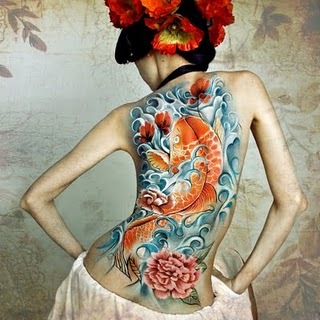 One of the interesting designs is inking a half dragon half fish on your body. You could also show the koi fish at the bottom of a waterfall and the dragon peering down from the top of the fall. You can also have a tattoo with two koi fish swimming in opposite directions as if representing the two aspects of life, the good and the bad. One of the other things that you could try is the two fish jumping up side by side with their tails in the water. 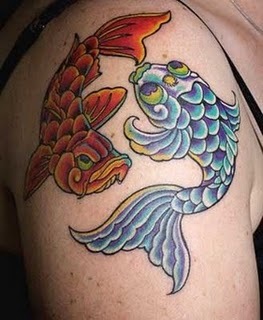 As the fish represents love, you could have the two koi fish kissing each other surrounded by underwater flowers. The secret to a getting a good tattoo is finding the right artist and taking care of your tattoo to prevent the ink from fading. Since this is a permanent art form make sure you choose your design wisely along with the body part you want to get tattooed.